And I shoot them both.I shot Veronika* all the time at my first LFW, then didn't see her much, but other people did. Now we greet each other like old friends but I don't have a clue who she is, or what she does, just that she's really really nice. Some people are like this. (thank you Ediot: Veronika's blog is VENKAVISION. 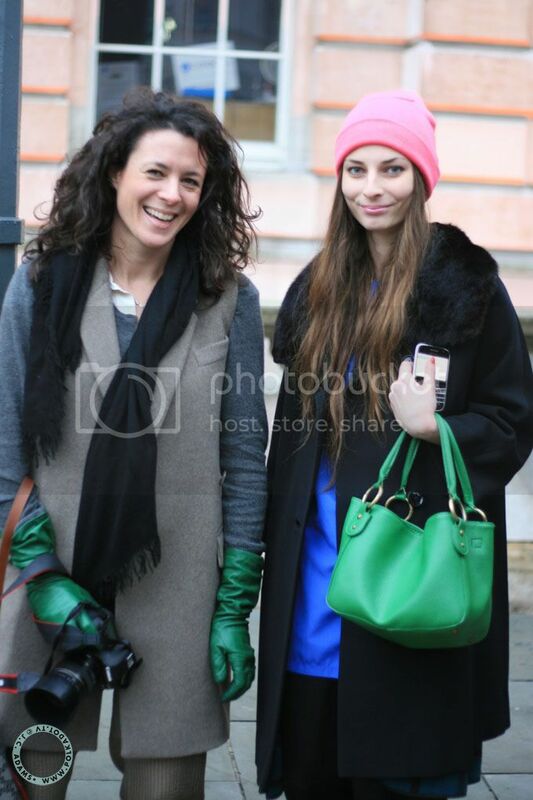 I'm all fashion weeked out at the moment - so many photos yet to process.... Love Garance's green gloves. hello, how cool you met the two and they even dressed alike somehow! what a coincidence! I love the fact that they're matching with the green! Those gloves in particular look excellent for photography. I know what you mean about seeing someone at the same event year or year even though you don't know them but you have the event in common - I really like stories like that. On a different note altogether, what model of the canon eos do you use please Jill? the photos are fantastic by the way! alexandra: it's either a 50D or 30D - i don't have it in front of me. not very expensive - and we bought it used. i mainly use a 50mm lens which the guy said makes it as close to what i'm used to with my dad's beloved (film, non digital) pentax from the 60s - that's why i have to stand so far back when i shoot top to toe. i do have a zoom that i can use to get wide angle shots but i dont like the feel of the photos as much as the 50mm lens. haha, I always love to take pictures of other photographers taking pictures. It's so much fun. Love your pictures. garance looks charming. she just glows! and the pops of green are just right for pre-spring. but you do know her blog right? Everyone's been wearing such great colors now. 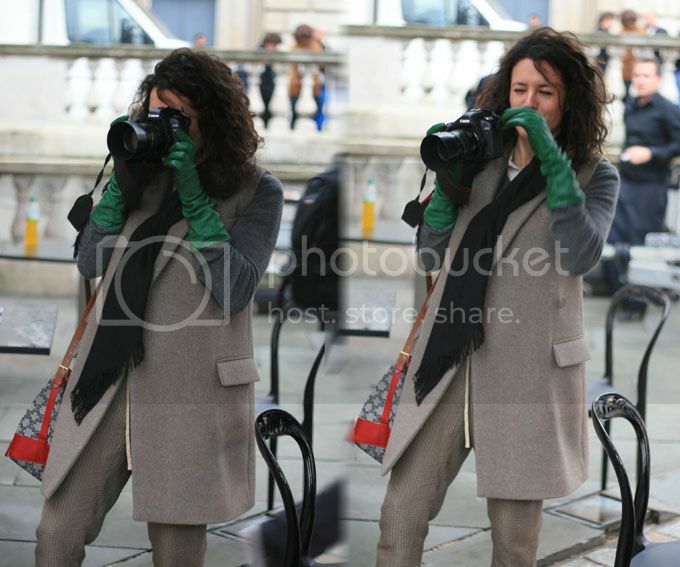 Love the kelly green gloves and bag. I think I need to invest in some color pieces myself. 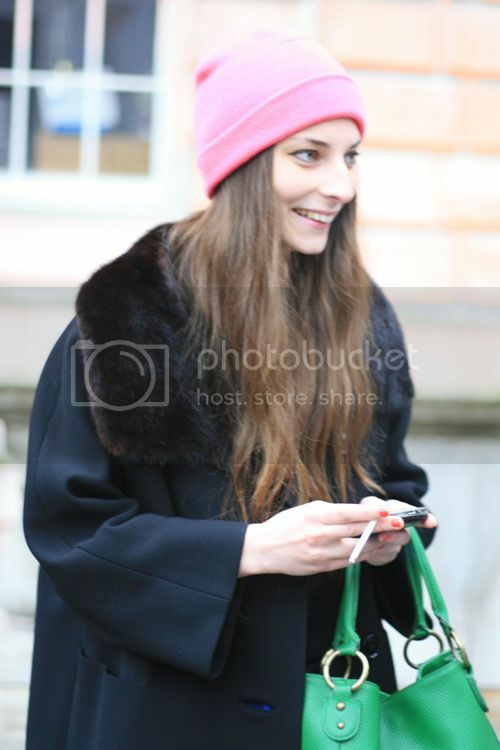 Ahh that green bag is from topshop from about 5 years ago...If im correct. I brought it when i was 15 .
; ) Whoever you are - Anonymous - if you happen to read this: isn't that funny, just think: someone might have bought the same bag you did, five years ago, and then gave it away.. and Veronika got it at a charity shop.. or if you gave yours away, this could be the same one. I love that kind of thing. 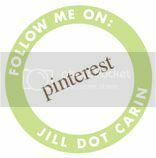 That's why the stories on Erin's blog: dress a day (sidebar) are so interesting. She makes whole stories out of one vintage dress. Ediot! I just realised you put this here. No I didn't know it, THANK YOU I'll link it asap. Hi Jill, anonymus is right, the bag is really from topshop, i got it in barcelona like 7 years ago:) and I haven't used for many many years but i loved its color now!! btw thank you for the nice words and the comment, i ll send you my contact details in email:) Hope you had a great weekend! starting at the end and working backwards.